Nationally known for its Summer and Winter Fests, SJZ also brings the community together for more than 100 free live music events each year, and provides much-needed education programs which allow access to music for everyone. Please donate by December 31 to strengthen our programs as we begin Summer Fest’s 30th Anniversary year. Many companies match their employees’ charitable giving 1:1. Does yours? This can be a great way to double the impact of your gift. Let us know in the Comments field in the online donation form. These are a few of the things your support enabled us to do in 2018. Our highly acclaimed youth development program on San Jose’s East Side is now in five school sites, reaching 1,000 students with a new general music program, instrument training, homework assistance, mentorship and nutritious snacks. 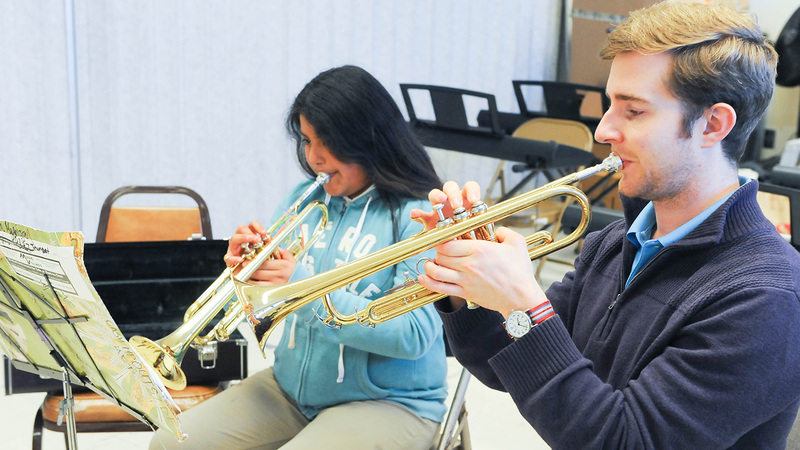 Most of these students would not have access to music education without the program. For over 20 years, our Summer Jazz Camp has inspired and taught promising middle and high school students in all aspects of jazz. Each year, more than 100 campers have the opportunity to work with an internationally known jazz star—in 2018 it was saxophonist Donny McCaslin. Your donations fund scholarships to ensure access to all promising students. Our Boom Box mobile stage was a nearly ubiquitous feature at Bay Area community events in 2018, including Viva Calle, the SoFA Street Fair, Japantown Immersive, Pow! Wow! San Jose, La Ultima Parada, SV Turkey Trot and Santa Run, Juneteenth, SF’s Carnaval Celebration and more than 60 others. Silicon Valley has phenomenal musicians that deserve a wider audience. In 2018 we formed the SJZ Collective, comprised of musicians that teach at our Summer Jazz Camp each June. We just toured the Collective to Taiwan, where they were invited to perform at the Taichung Jazz Festival. They release their first EP on December 14. There was a tremendous energy around this year’s Winter Fest, which featured 28 free and ticketed events in San Jose and Palo Alto. Many of the concerts were filled to capacity including concerts by Dee Dee Bridgewater, Veronica Swift, Benny Green and Cyrus Chestnut. Summer Fest brought 43,000 people to downtown San Jose to enjoy jazz, Latin, R&B, blues and everything in between. Ticket sales support half the cost of this great event—we rely on grants, sponsorships and your donations for the rest. We look forward to the 30th anniversary of our flagship Summer Fest, and a bold new series of events we’ll announce in the New Year that explore the sounds of our community and celebrate dozens of local musicians.